I had just engaged each of these companies either on a call, online or an in-person service. Each company connected for survey/feedback (promising it would take 3-5 minutes). I found Bank of America curious. During my initial call to them I was transferred to a second representative; therefore, I received two survey requests. Two representatives and two surveys! I noticed that I had not before experienced this volume of email communication requesting feedback from vendors/suppliers. This was new, not an occasional request but now a regular occasion. Feedback is no longer an ad-hoc transaction that occurs yearly; some type of survey now occurs after each transaction. In addition to email surveys, most vendors inform me of the option to complete a brief telephone survey after each call. This struck me as an important message: businesses cannot afford to take anything for granted today. It also occurred to me how valuable feedback is becoming, how much organizations and companies rely on it, and how much they must invest to seek it out today. Upon reflection, I realized the importance of feedback; what it takes to give it, and how much it takes to receive it. 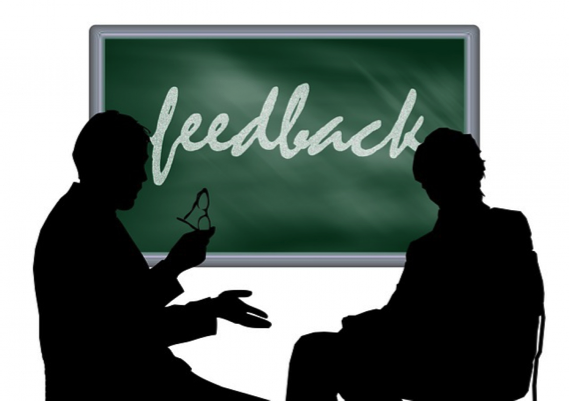 This blog post offers some great advice for receiving feedback. Beyond a simple transaction, feedback is also becoming the lifeblood of our work life, our consumer consciousness, and our expectations around business. We’ve turned a corner in the Information Age where exchanging ideas, rants, raves, comments, posts, or suggestions is simply expected, shifting consumer expectations. Even conventional performance reviews have been chucked by several larger companies in favor of more regular, and frequent feedback sessions (see here) to support individual performance and development (see here) in an authentic, rather than contrived, manner. So, feedback is an expectation that is coursing through our lives. Consider if you visited a shopping website two months ago and experienced a clunky checkout process, and then visited it again to find the same awkwardness. Even if there isn’t a feedback mechanism in place, we’d likely assume that one existed. We’d further assume that they ignored feedback and might conclude that this company either doesn’t listen, doesn’t care or just isn’t able to manage these issues. Either conclusion might prevent us from returning. Our instant connectivity has normalized feedback: we expect that companies will secure feedback and improve. This may be one of the new organizing principles for future organizations. Everyone will need to be adept at how to view input. How to listen as a coach, a therapist or user-interface designer. Reject it. Simple enough, right? Rejecting feedback has its own system of thought. We never ask and just assume all is well. We avoid opportunities to hear feedback or deny it when it’s delivered. Receive it, Conditionally. These people fixate on how we deliver feedback. A belligerent customer is wrong, and a polite prospect is perfect. What’s wrong with this picture? A customer has invested in your product and a prospect has no skin in the game. Both, however, can offer important information to support your service and your future. Regardless of how it’s delivered, packaged, or wrapped, get beyond the “How” and to the “WHAT.” We need the content (WHAT) delivered. So unload it from the package, get it all and thank the person. Receive to Rationalize. These people are most diplomatic. Some receive your input, “yes-you”, nod-nicely, and never do anything. Others might address items they find acceptable or agreeable. They rationalize the rest away, remarking: “They do not understand,” or “we’ve already reviewed/tried it,” or “if we had the time or money we could do something.” In any case, it’s hard to argue with this politeness or rationale. The problem is that all feedback contains some truth, and we soon realize that discrediting every complaint prevented us from being interested enough to investigate. Receive it Fully. These people begin with interest, the kind of interest that sees the world as a puzzle. They accept that they do not have all the pieces and that each bit of feedback or input offers another piece to complete the puzzle. Without assuming much — even if something has been tried before — these people are interested in discovering anything they may have missed or that might have changed. If they cannot act now, they capture notes, and return once they secure more information. Seeking out feedback benefits us, even if we cannot use it. Input from others helps us to see different points of view, while clarifying our view; provokes us to consider new ideas, while refining old ideas; and presents new questions while expanding our commitment to listen and learn. Giving feedback requires a commitment. People offering it, want to help you improve. Many companies now provide lottery drawings for gift cards to secure your feedback. The reason is simple: Feedback is the new R&D. It is much less expensive and more accurate to get real live feedback than to hire consulting firms to poll users or engage focus groups in creating “messages” that may or may not reflect real-life experiences. Further, the pace of change makes obsolete analysis and reports with recommendations. Real-time feedback is critical, and capturing it allows us to recognize any blind spots, to discover any missed opportunities, and to find new ways to serve customers. Ultimately, to be able to receive feedback is akin to how an organism interacts with its environment, absorbing cues to grow and expand. Remember this; people do not take time to write, to complete surveys or to complain unless they care. That care may be tucked beneath rants or complaints for you to recognize, cultivate, and then to harness. Become the person who can receive feedback, and you will find ways to harness that care.